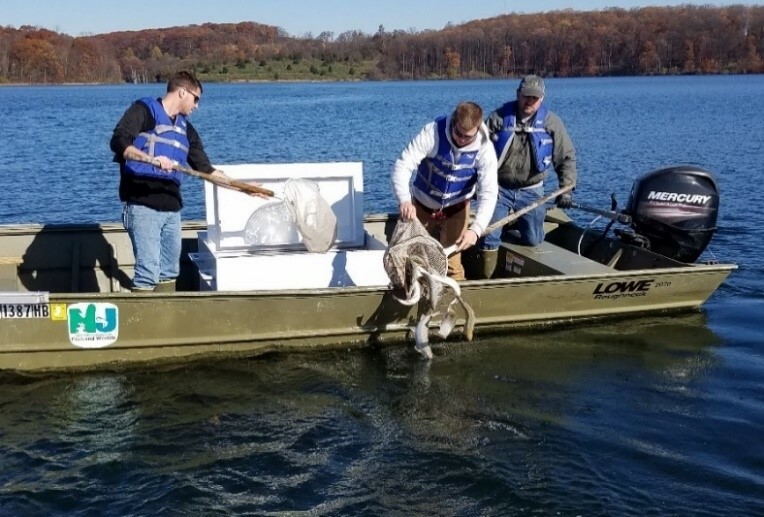 (18/P098) TRENTON – The Department of Environmental Protection’s Division of Fish and Wildlife is expanding its popular landlocked salmon stocking program to a fourth northern New Jersey lake – the Merrill Creek Reservoir in Warren County. This fall, the Division of Fish and Wildlife has stocked more than 2,500 salmon in the four lakes. The others are Lake Waywayanda and Lake Aeroflex in Sussex County and Tilcon Lake in Morris County. Native to eastern Canada and Maine, landlocked salmon are closely related to Atlantic salmon and are nearly identical in appearance. Unlike Atlantic salmon, which migrate from saltwater to spawn in freshwater streams, the landlocked salmon has adapted to spend its entire life cycle in freshwater. Landlocked salmon have been successfully introduced to suitable waters outside their native range, including New Jersey, New Hampshire, Vermont, Massachusetts and New York. Landlocked salmon were once privately stocked in New Jersey around 1950. The state launched its current stocking program in 2006, with stockings at Lake Waywayanda in Waywayanda State Park and Lake Aeroflex in Kittatinny Valley State Park. The program expanded to Tilcon Lake in Allamuchy Mountain State Park in 2014. 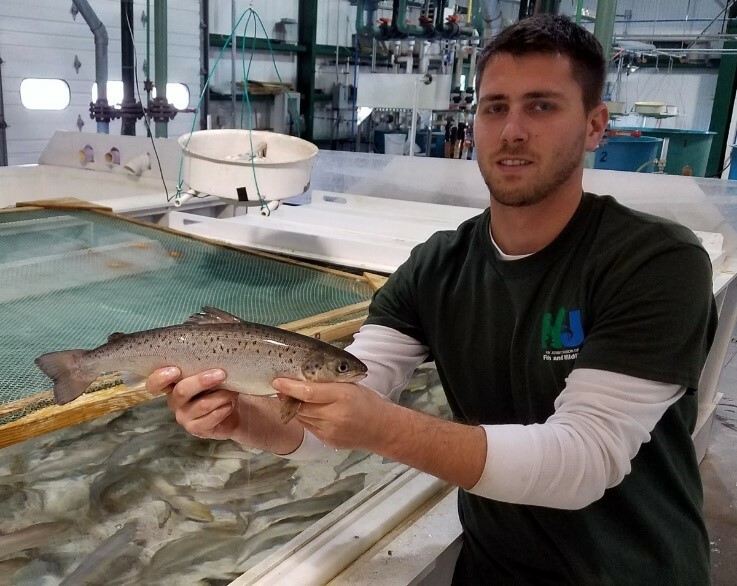 The Massachusetts Division of Fisheries and Wildlife provides free surplus fingerlings to the New Jersey Division of Fish and Wildlife, which rears them in the Hackettstown Fish Hatchery until they are ready for release. In return, New Jersey has given Massachusetts surplus northern pike. To survive year-round in New Jersey, salmon need deep cold lakes that hold oxygen well and protect them from the stress of summer heat. The four lakes in the program provide the perfect environment for salmon. In addition, these lakes have abundant populations of alewife, a herring species that salmon can feed on. Landlocked salmon are closely related to brown trout and anglers may have difficulty telling them apart. Because size and creel limits differ for salmon and trout, anglers should know how to identify them and, to comply with regulations, quickly release salmon smaller than the minimum. The four lakes have special regulations based on trout in them. Lake Waywayanda, Lake Aeroflex and Tilcon Lake are categorized as Holdover Trout lakes. 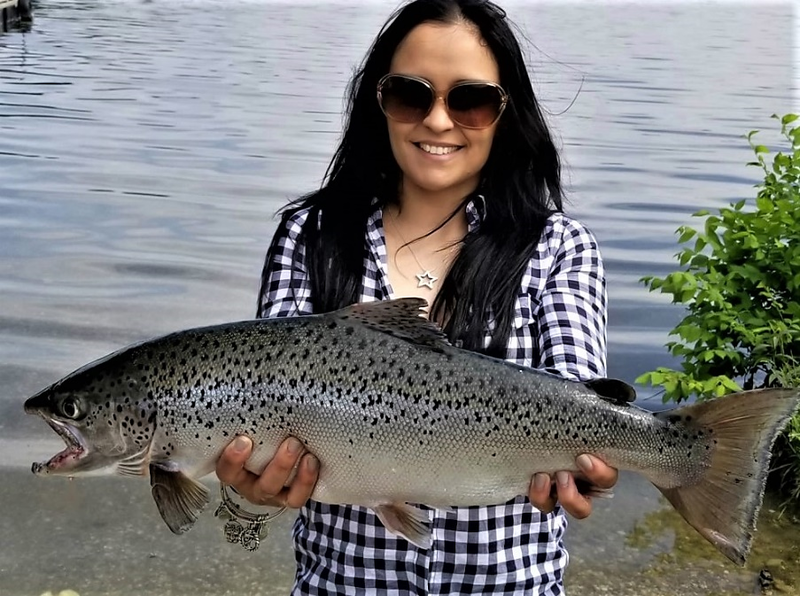 Keeper salmon in these waters must be a minimum of 12 inches with a limit of two per day, except during the pre-season trout closure from March 18 through 8 a.m. on April 6, 2019. During this time, any salmon caught must be released immediately. The size limit in the Merrill Creek Reservoir, a Trophy Trout Lake, is 15 inches for salmon, brown trout and rainbow trout. Year-round, only two fish of these species in any combination and meeting the size limit may be kept. There is no pre-season fishing closure in the reservoir.